Holika Holika Baby Silky Foot Mask - Cherry Colors - Cosmetics Heaven! 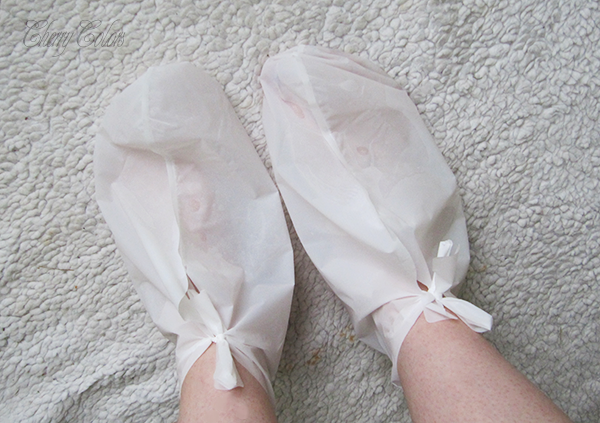 I was always curious about these acid feet masks that promise super smooth (baby) feet. Last month I had a "fu$k it" moment and bought this box from Holika Holika. One set is about $5. Holika Holika is a Korean brand known for cute and practical packaging. They mostly appeal to younger generations, but since I'm still young at heart they are very much loved by me :). The mask came about a month later (Ebay) and of course, I rushed to take pictures and use it. In the box, you get the mask (shaped like two cutest feet) and a pair of one use plastic socks. Or err whatever they are. My pair didn't come with English instructions except for some "about it" part. I didn't mind because from the box I could read "30 minutes" so I didn't even bother to check the internet for full instructions. How silly of me! The pictured instructions are pretty straight forward as in, put your feet in the "socks", pour the liquid in and wait for one hour and a half. Of course, I didn't know that at the time. I thought I had to wait for 30 minutes only. Well.. Yes. And I also missed the internal part where the cloth compartment is so I had to reposition my feet once the liquid was already inside. I must say that I left it on for 45 min because I was feeling adventurous and wanted a better result. Little did I know that I actually left it on for too little. But nevertheless. After the waiting period, I washed my feet with warm water and went on with my day. After four days, when I was taking my shower I noticed my feet peeling when it contact with warm water. And by peeling, I mean layers coming off. Not just the regular old' ball point or heel, no no. I was feeling a little curious at the time because I simply forgot about the peeling. But after 4-7 days the peeling should occur and let me tell you something. It is fascinatingly gross. I did, however, use the Pedi mouse to scrub all the excess skin off, which you shouldn't and later added a hefty layer of cream on my feet. I did notice that my feet are smoother and softer after the mask and I can't wait to get another one to keep it on for longer. It's such a weirdly fun experience! I think that this mask totally works and will repurchase it in the future.